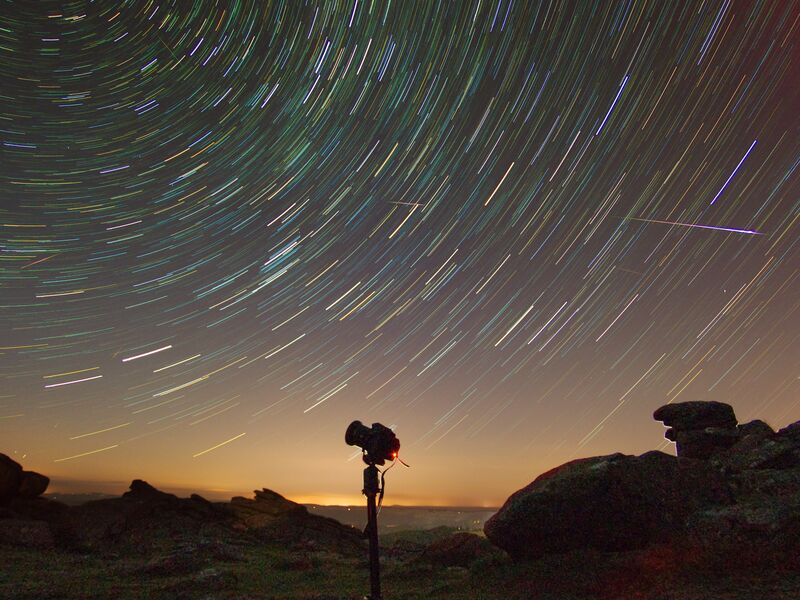 A fisheye lens view of the rocks of Hound Tor with star trails, crossed by meteors from the Perseids meteor shower. This image was featured in the BBC’s coverage of the 2016 Perseids Meteor Shower. I’d been wanting to photograph a major meteor shower for a few years, but for each previous shower either the weather was against me, or I’d had to be up early for work the next morning. Fortunately this year the exceptionally high activity of the Perseid Meteor Shower coincided with some free time and a window of clear skies – at least for a few hours. Late on August 11th, I headed up to Hound Tor mostly to get away from the worst light pollution of town, but also to provide an interesting foreground for my images. Hound Tor is a dramatic and well-known location, as seen in the BBC’s Sherlock episode ‘The Hounds of Baskerville’ with Benedict Cumberbatch. I arrived at Hound Tor car park around 22:45; there were half a dozen other cars there, with groups of people watching the meteors from in or near the car park. However, I headed up a few hundred metres cross country to the top of Hound Tor, which I had to myself. The moonlight helped me to find my way up safely and set up my equipment. Fortunately the moon set around 00:45; moonlight lightens the sky so much that it’s difficult for eye and camera to make out fainter meteors. I set up my cameras to shoot continuously without further intervention, so for a good while I could curl up with a blanket in a bivvy bag with a mug of hot chocolate and enjoy the meteor shower. In one 20 second exposure, we can see trails from an aircraft (left), satellite (centre, faint) and Perseids Meteor. 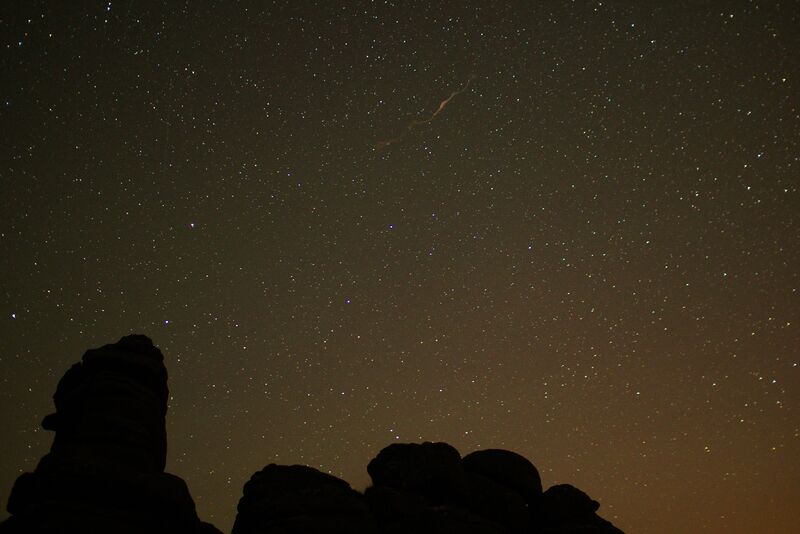 The changing colours of the meteor trail reflect the different materials of the meteor. I continued shooting until the cloud started coming in more heavily approaching 02:00. A compiled shot of the brightest meteors I captured during the night on Hound Tor. I set up three cameras bodies – two DSLRs and a compact system camera – on sturdy tripods. Because meteors are unpredictable and last only a second, repeated long exposure images are taken in order to beat the odds and actually capture them in images. 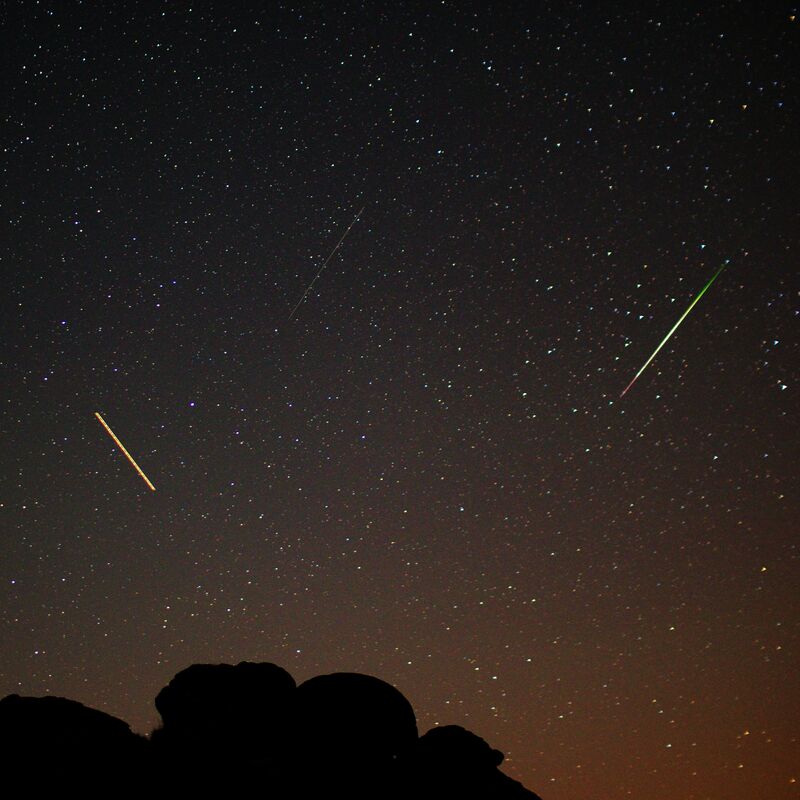 These sequences of images can be combined either in camera or later in software to produce star trail images (where the brighter meteors can be seen crossing the trails), composite images of several meteors in one frame, or time lapse videos. The top of the Tor is prone to gusts of wind, so a very stable tripod is essential to prevent blurring in the images. Some of the brightest (‘bolide’) meteors left behind faint smoke trails, picked up by the camera, that took several minutes to dissipate. I set up my Pentax K3 mk ii with a wide-aperture Sigma 30mm f/1.4 lens. A lens like this lets in a lot of light so will show up fainter objects in the night sky than others. I took a handful of test shots to get a good composition and double-check that the stars were showing up well on the images. The settings used were 20 seconds shutter speed (so that individual frames did not show star trails), aperture f/1.8 (which is sharper than shooting with the aperture wide open) and ISO sensitivity 3200. I used the camera’s built-in intervalometer to continuously take a shot every 22 seconds (it’s important to leave a 2-3 second gap between shots as the camera has a short delay to process and save an image after a long exposure). 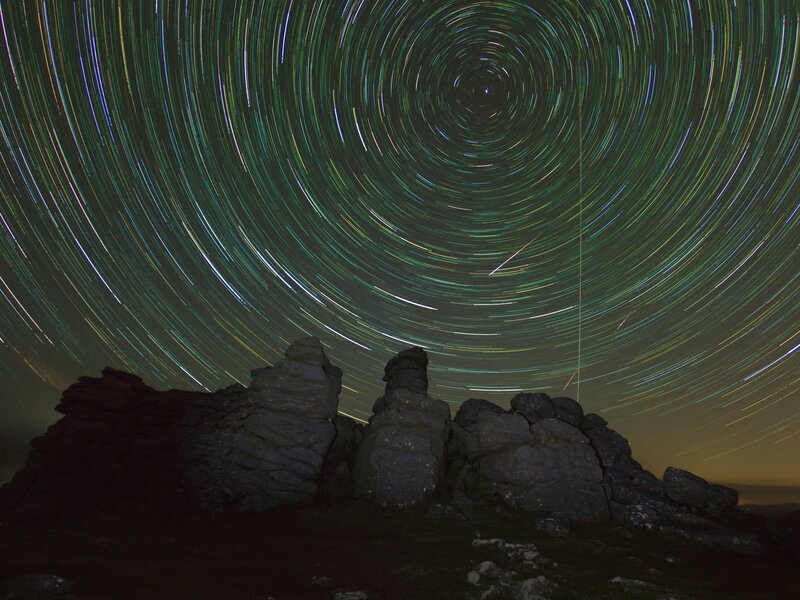 Star trails north-east from Hound Tor, crossed by a bright Perseid meteor, with my Pentax K-3 mk ii in-shot. I set up my K-3 ‘classic’ with a 10-17mm fisheye lens. While this lens doesn’t let in as much light, it can capture a huge swathe of the sky, giving much better results for star trails and a much larger area in which to pick up bright meteors. In this case, I used the camera’s built-in intervalometer to create multi-frame composite images in camera, so that I had the images ready to share the next morning without further processing work. The interval setting used kept only the brightest parts of the individual frames to create the final image. The settings used for each frame were focal length 10mm, 30 second shutter speed, aperture f/3.5 and ISO 6400. Part way through the night I stopped the automatic shooting (every 33 seconds) and moved the camera to start again with a different view. Focusing in the dark was difficult with the fisheye lens; I used a torch to illuminate the rocks at a distance from me, providing a lighter area for the camera’s autofocus to use.